Kids love to help out in the kitchen, these kids recipes will let them (and you) have fun making great tasting snacks, meals and treats. If you’re looking for fun ways to spend more time with your kids, teaching them to create tasty foods is the perfect way. 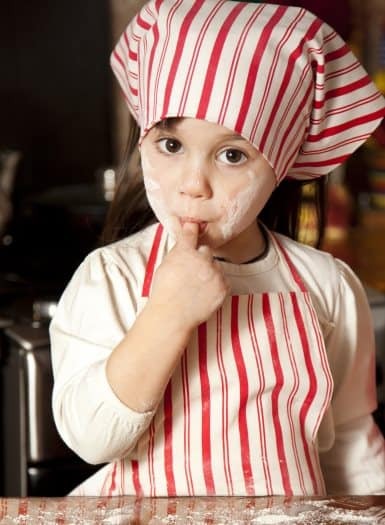 Cooking and baking with children is a great way to spend quality time with them while teaching them basic skills. For quick lunches, tortilla rollups are a quick and easy way to wrap up something yummy. Just take a small tortilla and warm it in the microwave for a few seconds. Choose one or more fillings, such as jelly, peanut butter, ham, cheese, or salsa. Wrap the tortilla into a tube shape while it is still warm. For a sweet treat, cheesecake apple dippers are delicious fruity bites. Wash, slice, and core two apples. Mix one container of cheesecake flavored yogurt with one tablespoon of brown sugar in a small bowl. Dip the apple slices in the brown sugar cheesecake mixture and enjoy. Below are many more made-for-kids recipes, most use ingredients you can find easily, or you may even have them on hand right now. Round up your aprons and get started, breakfast, these are all the best recipes for kids from A to Z.